The most recent earthquake in Ohio of any appreciable magnitude occurred on December 31, 2011, at 3:05pm EST. It had a magnitude of 4.0, and its epicenter was located approximately 4 kilometres northwest of Youngstown (41°7′19.1994″N 80°41′2.3994″W﻿ / ﻿41.121999833°N 80.683999833°W), near the Trumbull/Mahoning county border. There were three other cultures contemporaneous with the Mississippians: the Fort Ancient people, the Whittlesey Focus people & the Monongahela Culture. All three cultures disappeared in the 17th century. Their origins are unknown. It is generally believed that the Shawnees may have absorbed the Fort Ancient people. It's also possible that the Monongahela held no land in Ohio during the Colonial Era. The Mississippian Culture were close to and traded extensively with the Fort Ancient people. Indians in the Ohio Valley were greatly affected by the aggressive tactics of the Iroquois Confederation, based in central and western New York. After the Beaver Wars in the mid-17th century, the Iroquois claimed much of the Ohio country as hunting and, more importantly, beaver-trapping ground. After the devastation of epidemics and war in the mid-17th century, which largely emptied the Ohio country of indigenous people by the mid-to-late 17th century, the land gradually became repopulated by the mostly Algonquian. Many of these Ohio-country nations were multi-ethnic (sometimes multi-linguistic) societies born out of the earlier devastation brought about by disease, war, and subsequent social instability. They subsisted on agriculture (corn, sunflowers, beans, etc.) supplemented by seasonal hunts. By the 18th century, they were part of a larger global economy brought about by European entry into the fur trade. The indigenous nations to inhabit Ohio in the historical period included the Iroquoian, the Algonquian & the Siouan. Ohio country was also the site of Indian massacres, such as the Yellow Creek Massacre, Gnadenhutten and Pontiac's Rebellion school massacre. Most Native Peoples who remained in Ohio were slowly bought out and convinced to leave, or ordered to do so by law, in the early 19th century with the Indian Removal Act of 1830. On February 19, 1803, U.S. President Thomas Jefferson signed an act of Congress that approved Ohio's boundaries and constitution. However, Congress had never passed a resolution formally admitting Ohio as the 17th state. The current custom of Congress declaring an official date of statehood did not begin until 1812, with Louisiana's admission as the 18th state. 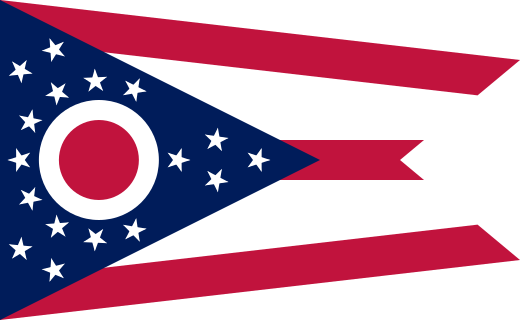 Although no formal resolution of admission was required, when the oversight was discovered in 1953, Ohio congressman George H. Bender introduced a bill in Congress to admit Ohio to the Union retroactive to March 1, 1803, the date on which the Ohio General Assembly first convened. At a special session at the old state capital in Chillicothe, the Ohio state legislature approved a new petition for statehood that was delivered to Washington, D.C. on horseback. On August 7, 1953 (the year of Ohio's 150th anniversary), President Eisenhower signed a congressional joint resolution that officially declared March 1, 1803, the date of Ohio's admittance into the Union. From just over 45,000 residents in 1800, Ohio's population grew at rates of over 10% per decade (except for the 1940 census) until the 1970 census, which recorded just over 10.65 million Ohioans. Growth then slowed for the next four decades. The United States Census Bureau estimates that the population of Ohio was 11,689,442 on July 1, 2018, a 1.33% increase since the 2010 United States Census. Ohio's population growth lags that of the entire United States, and Caucasians are found in a greater density than the United States average. As of 2000, Ohio's center of population is located in Morrow County, in the county seat of Mount Gilead. This is approximately 6,346 feet (1,934 m) south and west of Ohio's population center in 1990. In 2010, Ohio was ranked No. 2 in the country for best business climate by Site Selection magazine, based on a business-activity database. The state has also won three consecutive Governor's Cup awards from the magazine, based on business growth and developments. As of 2016, Ohio's gross domestic product (GDP) was $626 billion. This ranks Ohio's economy as the seventh-largest of all fifty states and the District of Columbia. As of 2008, Ohio's voter demographic leans towards the Democratic Party. An estimated 2,408,178 Ohioans are registered to vote as Democrats, while 1,471,465 Ohioans are registered to vote as Republicans. These are changes from 2004 of 72% and 32%, respectively, and Democrats have registered over 1,000,000 new Ohioans since 2004. Unaffiliated voters have an attrition of 15% since 2004, losing an estimated 718,000 of their kind. The total now rests at 4,057,518 Ohioans. In total, there are 7,937,161 Ohioans registered to vote. In United States presidential election of 2008, then-Senator Barack Obama of Illinois won 51.50% of Ohio's popular vote, 4.59 percentage points more than his nearest rival, Senator John McCain of Arizona (with 46.91% of the popular vote). However, Obama won only 22 of Ohio's 88 counties. Since 2010, the Republicans have largely controlled Ohio state politics, including a super-majority in the state's House, a majority in the state Senate, the Governorship, etc. As of 2014, the state Senate is 1 Republican away from a super-majority. Akron () is the fifth-largest city in the U.S. state of Ohio and is the county seat of Summit County. It is located on the western edge of the Glaciated Allegheny Plateau, about 30 miles (48 km) south of Cleveland. As of the 2017 Census estimate, the city proper had a total population of 197,846, making it the 119th-largest city in the United States. The Greater Akron area, covering Summit and Portage counties, had an estimated population of 703,505.The city was founded in 1825 by Simon Perkins and Paul Williams, along the Little Cuyahoga River at the summit of the developing Ohio and Erie Canal. The name is derived from the Greek word signifying a summit or high point. It was briefly renamed South Akron after Eliakim Crosby founded nearby North Akron in 1833, until both merged into an incorporated village in 1836. In the 1910s, Akron doubled in population, making it the nation's fastest-growing city. Cincinnati ( SIN-sih-NAT-ee) is a major city in the U.S. state of Ohio, and is the government seat of Hamilton County. Settled in 1788, the city is located at the northern side of the confluence of the Licking and Ohio rivers, the latter of which marks the state line with Kentucky. The city drives the Cincinnati–Middletown–Wilmington combined statistical area, which had a population of 2,172,191 in the 2010 census making it Ohio's largest metropolitan area. With a population of 296,943, Cincinnati is the third-largest city in Ohio and 65th in the United States. Its metropolitan area is the fastest growing economic power in the Midwestern United States based on increase of economic output and it is the 28th-largest metropolitan statistical area in the U.S. Cincinnati is also within a day's drive of 49.70% of the United States populace.In the nineteenth century, Cincinnati was an American boomtown in the middle of the country. Throughout much of the 19th century, it was listed among the top 10 U.S. cities by population, surpassed only by New Orleans and the older, established settlements of the United States eastern seaboard, as well as being the sixth-biggest city for a period spanning 1840 until 1860. As Cincinnati was the first city founded after the American Revolution, as well as the first major inland city in the country, it is regarded as the first purely "American" city.Cincinnati developed with fewer immigrants and less influence from Europe than East Coast cities in the same period. However, it received a significant number of German immigrants, who founded many of the city's cultural institutions. By the end of the 19th century, with the shift from steamboats to railroads drawing off freight shipping, trade patterns had altered and Cincinnati's growth slowed considerably. The city was surpassed in population by other inland cities, particularly Chicago, which developed based on strong commodity exploitation, economics, and the railroads, and St. Louis, which for decades after the Civil War served as the gateway to westward migration. Columbus ( kə-LUM-bəs) is the state capital of and the most populous city in the U.S. state of Ohio. With a population of 879,170 as of 2017 estimates, it is the 14th-most populous city in the United States and one of the fastest growing large cities in the nation. This makes Columbus the third-most populous state capital in the US (after Phoenix, Arizona and Austin, Texas) and the second-most populous city in the Midwest (after Chicago, Illinois). It is the core city of the Columbus, OH Metropolitan Statistical Area, which encompasses ten counties. With a population of 2,078,725, it is Ohio's second-largest metropolitan area. The city has a diverse economy based on education, government, insurance, banking, defense, aviation, food, clothes, logistics, steel, energy, medical research, health care, hospitality, retail, and technology. Columbus Region is home to the Battelle Memorial Institute, the world's largest private research and development foundation; Chemical Abstracts Service, the world's largest clearinghouse of chemical information; NetJets, the world's largest fractional ownership jet aircraft fleet; and The Ohio State University, one of the largest universities in the United States. As of 2018 the city has the headquarters of four corporations in the U.S. Fortune 500: American Electric Power, Cardinal Health, L Brands, Nationwide, and Big Lots, just out of the top 500.In 2016, Money Magazine ranked Columbus as one of "The 6 Best Big Cities", calling it the best in the Midwest, citing a highly educated workforce and excellent wage growth. In 2012, Columbus was ranked in BusinessWeek's 50 best cities in the United States. In 2013, Forbes gave Columbus an "A" grade as one of the top cities for business in the U.S., and later that year included the city on its list of Best Places for Business and Careers. Columbus was also ranked as the No. 1 up-and-coming tech city in the nation by Forbes in 2008, and the city was ranked a top-ten city by Relocate America in 2010. In 2007, fDi Magazine ranked the city no. 3 in the U.S. for cities of the future, and the Columbus Zoo and Aquarium was rated no. 1 in 2009 by USA Travel Guide. Dayton () is the sixth-largest city in the state of Ohio and the county seat of Montgomery County. A small part of the city extends into Greene County. The 2017 U.S. census estimate put the city population at 140,371, while Greater Dayton was estimated to be at 803,416 residents. This makes Dayton the fourth-largest metropolitan area in Ohio and 63rd in the United States. Dayton is within Ohio's Miami Valley region, just north of Greater Cincinnati. Along with defense and aerospace, healthcare accounts for much of the Dayton area's economy. Hospitals in the Greater Dayton area have an estimated combined employment of nearly 32,000 and a yearly economic impact of $6.8 billion. It is estimated that Premier Health Partners, a hospital network, contributes more than $2 billion a year to the region through operating, employment, and capital expenditures. In 2011, Dayton was rated the #3 city in the nation by HealthGrades for excellence in healthcare. Many hospitals in the Dayton area are consistently ranked by Forbes, U.S. News & World Report, and HealthGrades for clinical excellence.Dayton is also noted for its association with aviation; the city is home to the National Museum of the United States Air Force and is the birthplace of Orville Wright. Other well-known individuals born in the city include poet Paul Laurence Dunbar and entrepreneur John H. Patterson. Dayton is also known for its many patents, inventions, and inventors, most notably the Wright brothers' invention of powered flight. In 2008, 2009, and 2010, Site Selection magazine ranked Dayton the #1 mid-sized metropolitan area in the nation for economic development. Also in 2010, Dayton was named one of the best places in the United States for college graduates to find a job. Dino Paul Crocetti (June 7, 1917 – December 25, 1995), known famously as Dean Martin, was an American actor, comedian and singer. One of the most popular and enduring American entertainers of the mid-20th century, Martin was nicknamed "The King of Cool" for his seemingly effortless charisma and self-assurance.He and Jerry Lewis formed the immensely popular comedy duo Martin and Lewis, with Martin serving as the straight man to Lewis' slapstick hijinks. A member of the "Rat Pack", Martin went on to become a star of concert stages, nightclubs, audio recordings, motion pictures and television. James Abram Garfield (November 19, 1831 – September 19, 1881) was the 20th president of the United States, serving from March 4, 1881 until his death by assassination six and a half months later. He was the first sitting member of Congress to be elected to the presidency, and remains the only sitting House member to gain the White House.Garfield entered politics as a Republican in 1857. He served as a member of the Ohio State Senate from 1859 to 1861. Garfield opposed Confederate secession, served as a major general in the Union Army during the American Civil War, and fought in the battles of Middle Creek, Shiloh, and Chickamauga. He was first elected to Congress in 1862 to represent Ohio's 19th District. Throughout Garfield's extended congressional service after the Civil War, he firmly supported the gold standard and gained a reputation as a skilled orator. Garfield initially agreed with Radical Republican views regarding Reconstruction, but later favored a moderate approach for civil rights enforcement for freedmen. The Ohio River is a 981-mile (1,579 km) long river in the midwestern United States that flows southwesterly from western Pennsylvania south of Lake Erie to its mouth on the Mississippi River at the southern tip of Illinois. It is the second largest river by discharge volume in the United States and the largest tributary by volume of the north-south flowing Mississippi River that divides the eastern from western United States. The river flows through or along the border of six states, and its drainage basin includes parts of 15 states. Through its largest tributary, the Tennessee River, the basin includes several states of the southeastern U.S. It is the source of drinking water for three million people.The lower Ohio River just below Louisville is obstructed by rapids known as the Falls of the Ohio where the water level falls 26ft. in 2 miles and is impassible for navigation. The McAlpine Locks and Dam, a shipping canal bypassing the rapids, now allows commercial navigation from the Forks of the Ohio at Pittsburgh to the Port of New Orleans at the mouth of the Mississippi on the Gulf of Mexico. Newman won several national championships as a driver in Sports Car Club of America road racing, and his race teams won several championships in open-wheel IndyCar racing. He was a co-founder of Newman's Own, a food company from which he donated all post-tax profits and royalties to charity. As of November 2018, these donations have totaled over US$535 million. He was a co-founder of Safe Water Network, a nonprofit that develops sustainable drinking water solutions for those in need.In 1988, Newman founded the SeriousFun Children's Network, a global family of summer camps and programs for children with serious illness which has served 290,076 children since its inception. Toledo () is a city in and the county seat of Lucas County, Ohio, United States. Toledo is in northwest Ohio, at the western end of Lake Erie bordering the state of Michigan. The city was founded in 1833 on the west bank of the Maumee River, and originally incorporated as part of Monroe County, Michigan Territory. It was re-founded in 1837, after conclusion of the Toledo War, when it was incorporated in Ohio.